NEW DELHI, APRIL 17: Telangana Board is going to declare the result of TS inter exams on April 18, 2019 @5pm in a press conference to be held in Vidhya Bhavan in Nampally, Hyderabad. After that, the result will also be announced on the official website: results.cgg.gov.in. First and second year inter students (General and Vocational) will be able to access their result by following the steps given below. Latest: TS board is going to declare 1st, 2nd inter result on April 18 at 5 pm. Links are about to active as soon as the result is declared. How to check TS inter result 2019? Visit the official website i.e. 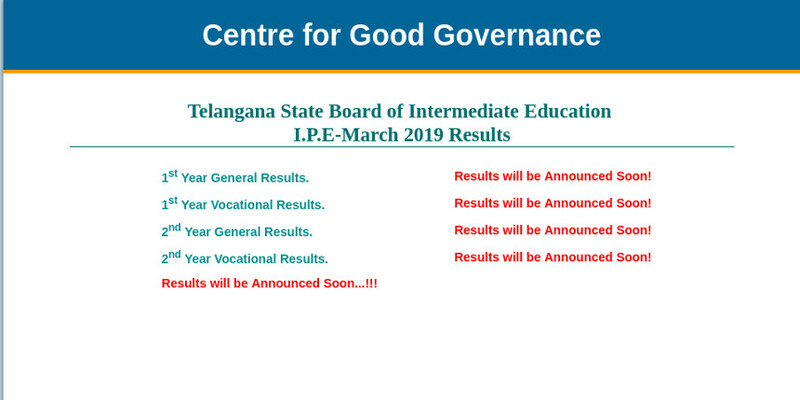 results.cgg.gov.in or bie.telangana.gov.in. Enter Hall Ticket number in the login window. Click on submit and TS Intermediate result will appear on the screen. Download and keep it safe for future reference. Candidates are waiting eagerly for their Telangana intermediate result. Soon they will be able to check their scores for the inter exams held between February 28 and March 18, 2019. Candidates will also be able to check their result using SMS facility. Last year, girls performed better than boys & the overall pass percentage was 62.35% which is expected to increase this year. All the best to all the Students!! !